Not a very decisive day for WTI but perhaps interesting because of its lack of anything decisive! It looks like we are going to close the day slightly higher than last week's close - but not by much. A look at the 30min bar chart shows an early push down through Friday's close but was soon met with buying and only offered a daytrade of 50 points before starting a climb back upwards. That climb has continued through the day consistently but without any real enthusiasm, and surely not suggesting any great anticipation of an aggressive bounce here yet? I am not sure if this kind of posting is expected here so please let me know if I am out of line here! Good stuff, Streamer. I don't know if @catch22 is still with us, but he is great at this kind of stuff. Anyway, keep it up. We welcome your thoughts, etc. You might want to check out the thread I started on "Gaming the Price of Oil". 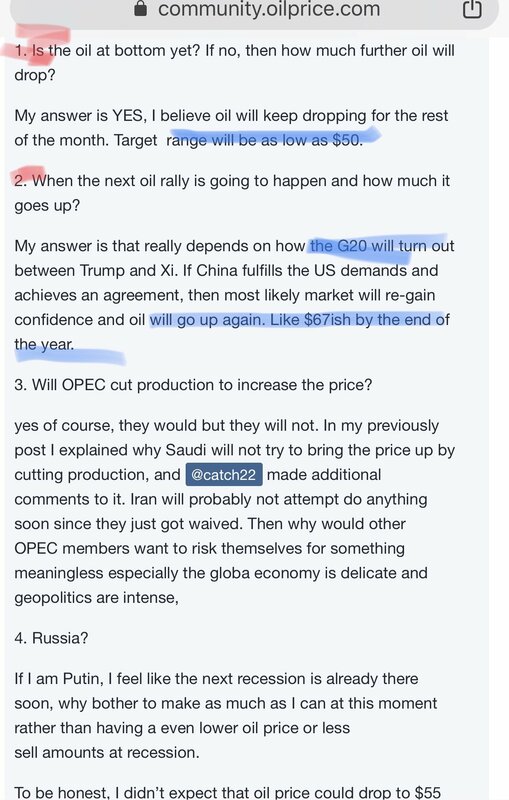 I should have included it in this thread, but I'm new to OIlPrice and didn't check other threads thoroughly enough. I would rather say that you continue posting here as we have many other comments already in this thread. you are not at all hijacking the thread...in fact glad to see you contributing such i sightful posts here!! Thanks for the confirmation and encouragement, Dan. I would emphasise again that I am a Newbie at this and my comments are more "thinking out loud as I progress (hopefully)" rather than educated comment on the oil markets! During the recent down move we saw a number of daily candles with a significant upper wick ( in the blue circle). These were very strong signals of aggressive and continuing selling pressure. Then last week we saw another such daily pin bar (first red circle) but with three differences: 1. it failed to take out the previous day's low, 2. it closed up from the day's open in spite of the long wick, 3. it formed an inside day compared with the day before. Yesterdays' price action is interesting in that managed to formed a slightly higher high after trying and failing to beak the downside and the end result is a mirror image pin par with the long wick to the downside (second red circle). This is often viewed as a strong bullish signal. Therefore, this could easily be a first reflection of a dwindling conviction that over-supply will be driving prices even lower combined with a possible growing expectation that OPEC+ will be turning off the production taps in the coming months to support prices. Personally, I suspect we might see some erratic movements which are typical at a turning point but may well include some higher prices from here. On the downside, if we break last week's low just under $55 then I will still be targetting that weekly 200 MA in the oblong in the chart. Yea, prices go down, hit a bottom and tremble a bit. Or do they? I mean, the graph itself tells you nothing if the prices will keep going down, or up. Breaking news may do so (but even those are tricky). So many after news starting with "even tho x happened, pricea continue to drop" (with x being an action that was supposed to rise prices). Interesting analysis of yours, how long have you been in this? Thank you very much...and for contributing to the thread! Let's just say long enough to realise that not yet long enough!! My preferred trading approach is to study price movement using various technical analysis techniques. But whatever approach one uses i think success is dependent more on other factors than the technique itself. It is revealing to note that one of the requirements of the recently imposed ESMA regulations is that European brokers have to declare what percentage of their retail clients are losing money. It seems that the majority of brokers are declaring that around 80% of their retail traders are losing funds! This is really quite staggering and there should be some serious studies of why this is so. There are some obvious reasons such as a lack of knowledge and experience and also over-trading, under capitalised and excessive risk taking. But I think one of the major areas that is seriously overlooked by traders is their risk/money management. It is so easy to be right with one's direction and still lose money with one's trade. For example, yesterday I sold the market and then saw the price move against me by about 80 points. If I had kept a close stoploss order in order to meet some fixed R:R rule then I could have ended up with a loss of 50 points instead of a gain of 70 points. That is a difference of 120 points between what my result would have been and what it actually was - and entirely due to the decision regarding where to position that stoploss order and nothing to do with the direction of the trade! Another reason for overall failure is a wrong attitude towards losses. Losses are inevitable and should be accepted as a kind of "overhead" cost of doing business. Losses are not "bad". The only "bad" trade is one that is taken for the wrong reasons, not because of the result. Every business has overhead costs that need to be covered by their profits and trading is no different. The key is to ensure, as every other business does, that the profits exceed the overheads - and that is the purpose of risk/money management. These are just the way I think of some of these issues. Strongly agree with what you have to say about losses. Yes I know .. now many are saying this. But like many others I was bearish on oil even after the IRANIAN SANCTIONS. wonder why and hw did I miss it! Interesting Mr. Kirkman! Hi Osama. Do you "follow" Tom? 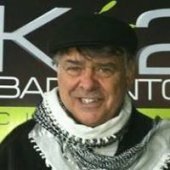 @Osama to follow - click on @Tom Kirkman's profile - and next to his profile picture it will say "follow member". Just did that. Thank you! @CMOP thank you....yes...I just did that. For my stupidest thoughts to the past unreasonable uptrend and the crazy downtrend is the markets are way over reacting. One thing I could reasonably tell is the instability effects caused by Trump, so everything has been magnified. Looked up the past few decades of oil chart, I barely see a $20 up/down happened in that short period of time. I personally and with some others here believed the oil (WTI) would come down to a $65 range, and it did happen as expected. However now it has dropped even further and significantly. 1. Is the oil at bottom yet? If no, then how much further oil will drop? My answer is YES, I believe oil will keep dropping for the rest of the month. Target range will be as low as $50. 2. When the next oil rally is going to happen and how much it goes up? My answer is that really depends on how the G20 will turn out between Trump and Xi. If China fulfills the US demands and achieves an agreement, then most likely market will re-gain confidence and oil will go up again. Like $67ish by the end of the year. 3. Will OPEC cut production to increase the price? If I am Putin, I feel like the next recession is already there soon, why bother to make as much as I can at this moment rather than having a even lower oil price or less sell amounts at recession. To be honest, I didn’t expect that oil price could drop to $55 range that soon... it is way too unrealistic. I am not sure what are these big players up to behind the scene, but somehow my feeling tells me there is something bigger coming up soon, and i don’t know what is it. lets see how it moves this month. Lots of conversations going on, Osama. You need to follow a few more people and then your notifications list will fill up. This thread is thin, that's for sure. Don't know why, but folks are definitely discussing markets and oil in other places on here. I HAVE BEEN MISSING ALL THE ACTION!!! i have been moonlighting since you guys are disappeared.. Going to the 6th December meeting?